What do we give our kids in their school break box? This is a universal question we as mums ask ourselves. It’s not an easy job to please the child with healthy snacks. I thought over this and came up with this recipe in which we satisfy both the aspects, the taste and the health. Digging from my Rajput roots I picked up my mum’s recipe of Churma and twisted it a bit by adding the healthy ingredients. 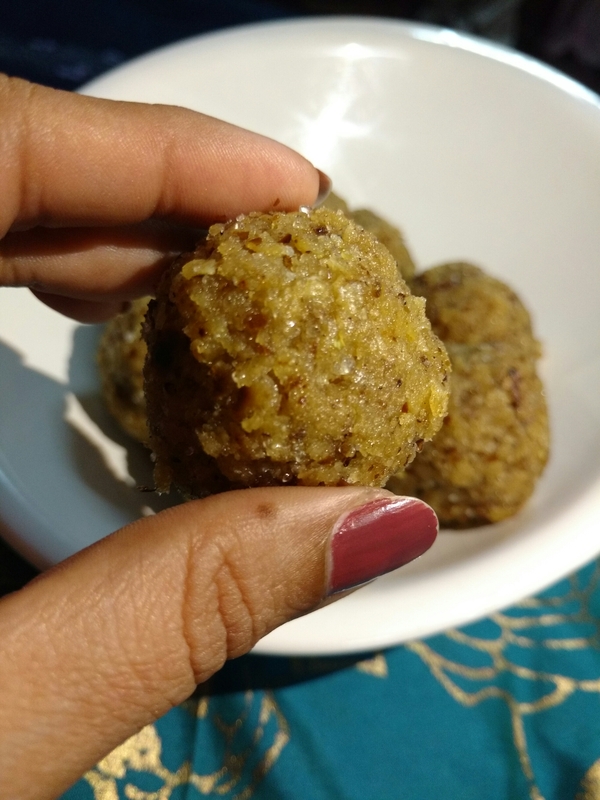 So here’s my take on quick and easy Churma laddoos. Whole wheat 1 kg, Soyabean 50 grams, Fenugreek seeds 2tabsp, Flax seeds 2/3 tabsp. Grind them into a fine powder and Do Not Sieve it. Ghee preferably home made 2/3 tabsp. Sugar as per your choice 5/6 tabsp and salt to taste. For the flavouring – nutmeg powder, cardamon powder 1/2 tsp each. Optional – Finely chopped nuts like cashew nuts, almonds, pistachios. Take a deep mixing bowl. Take the flour mix , season it with salt. Knead the flour with water or milk. The dough should be not too loose nor too stiff. Now make small balls and make chapatis /parathas. Slow roast the parathas by using little ghee. Make the parathas flaky by layering it with ghee and dry flour. After the parathas are cooled break them into small pieces and grind it into a coarse powder. Add sugar (preferably castor or powdered) , ghee, the flavouring of nutmeg and cardamon. And finally the chopped nuts. 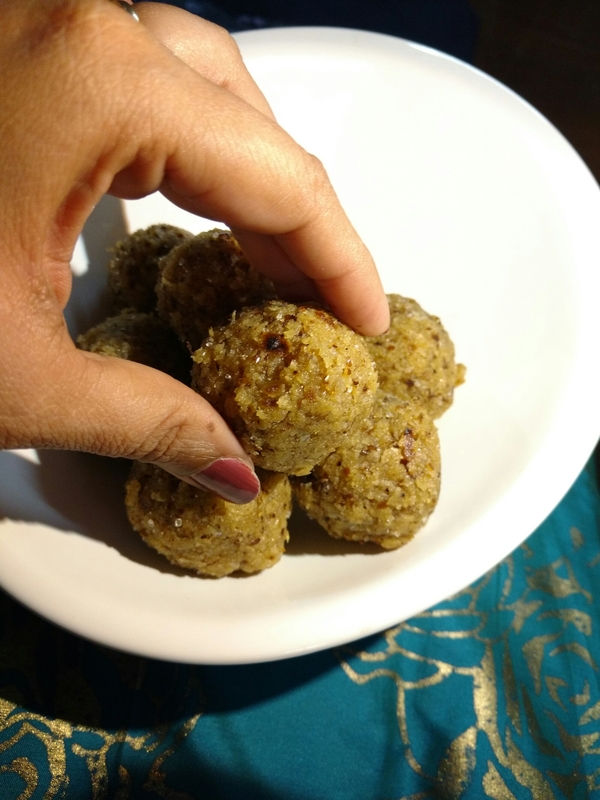 Mix it thoroughly and make small laddoos. Store it in an airtight container. Enjoy the healthy yet tasty bites. I always carry these while traveling. One doesn’t feel homesick nor do you end up eating junk food.